Originally in limp vellum binding tied with two red silk ribbons; later in Italian early 17th-century silver gilt covers by Antonio Gentili (stored separately as MS M.69a); inside front cover incised with name and arms of Cardinal Alessandro Farnese (1520-1589) and inside back cover incised with name and arms of Cardinal Odoardo Farnese (1573-1626); 18th-century brown leather envelope; in red morocco box (1907) by Léon Gruel. Purchased by J. Pierpont Morgan (1837-1913), 1903. Made for Cardinal Alessandro Farnese (1520-1589); his grand nephew and heir to his estates Cardinal Odoardo Farnese (1573-1626); Odoardo Farnese, Duke of Parma (1612-1646); Elizabeth Farnese, consort of Philip V, King of Spain (1692-1766); Charles III, King of Spain (1716-1788)? ; Ferdinand I, King of the Two Sicilies (1751-1825)? ; Francis I, King of the Two Sicilies (1777-1830)? ; Francesco II Borbone, King of the Two Sicilies (1836-1894); Alphonse de Bourbon (1841-1934); purchased by J. Pierpont Morgan (1837-1913) from the firm of J. & S. Goldschmidt, Frankfurt, in March 1903 through the agency of Rainer, Archduke of Austria (1827-1913); J.P. Morgan (1867-1943). Ms. book of hours for the use of Rome; written and illuminated in Rome, Italy; and dated 1546. Colophon on fol. 112v reads: Iulius. Clovius. Macedo Monumenta Haec. Alexandro. Farnesio Cardinali Domino Suo Faciebat MDXLVI. Decoration: 28 miniatures of which 3 are double page; elaborate historiated borders. Artist: Giulio Clovio, a Croatian born artist. 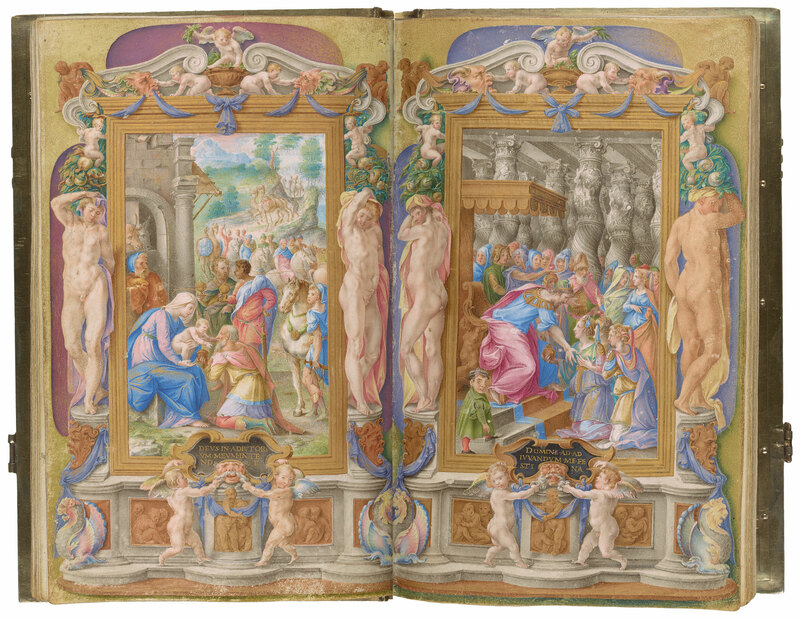 The Farnese Hours, the last great Italian Renaissance manuscript, was highly praised in Vasari's Lives of the Painters (1568). Of Clovio, a Croatian, Vasari said that there "has never been . . . a more rare painter of little things," calling him a "new, if smaller Michelangelo." Here the bareness of the Adoration of the Shepherds is contrasted with the lushness of paradise. The dramatic light generated by Jesus derives from the Revelations of St. Bridget, as does the motif of the Virgin exposing the Christ child—the shepherds had not been told the child's gender. Many details from the Fall of Man are based on Dürer's famous engraving of 1504.